Some glyphs have the ability to make you stop and smell the roses – read on to find out why Nikki Villagomez loves the comma from Bell Gothic Black. I first noticed the typeface Bell Centennial in 1997 when I was a sophomore studying graphic design at LSU. My professor would always set our project briefs in Bell Centennial’s Bold Listing. I thought the letters were so crazy with those wonky looking curves. I didn’t understand what I was looking at so I did some research and discovered that the typeface Bell Gothic was designed by Chauncey Griffith while he was at Linotype. It was commissioned by AT&T as a proprietary typeface for use in phone books. It was designed for maximum legibility in the adverse conditions of small print on poor-quality newsprint paper, into which ink tends to absorb and spread out. In 1978, Bell Gothic was replaced by Bell Centennial, designed by Matthew Carter on the one hundredth anniversary of AT&T's founding. This was the first time I had heard of a typeface being developed for a specific reason and it blew my mind. I began looking at letterforms differently and noticing all of the unique qualities that can make up a glyph. Everyone has a favourite letter (sup Mrs Eaves lowercase g) but as much as I love letters and numbers, commas hold a special place in my heart. I love what they represent. It’s a tiny mark that holds great weight. 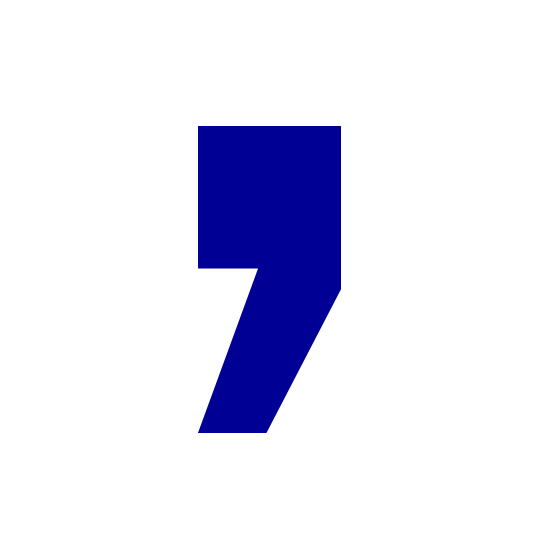 I have this specific glyph, the Bell Gothic Black comma, in 100 point tattooed on my wrist. It’s the typeface that first introduced me to typography, it reminds me to always give 100 per cent in everything I do and not rush through things. It’s the most beautiful of all letterforms. Described as a 'designer, blogger and typophile' (she has named one of her children after a font), Nikki Villagomez founded and was also president of the South Carolina chapter of the AIGA. Her entertaining and very accessible blog explores the relationship between Culture and Typography and has led to the publication of a very successful book and ongoing lecture programme of the same name.